Creep your way through 3 reels and 9 paylines in this haunting casino online slots game. If you like to push your limits and experience the fear factor then enter the haunted mansion and win yourself some cash. 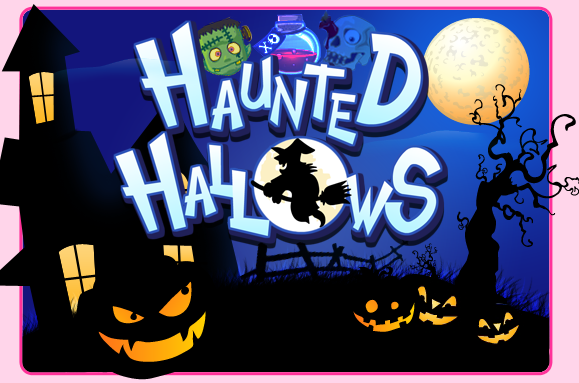 Match the pumpkins and potions and earn yourself a ticket out of this ghostly online slot. Join & spin today! Eyecon uses the latest technologies for their top-quality slot games, aiming to satisfy any type of player through a diverse portfolio built over 20 years. They guarantee highly enjoyable casino slot games and dedicate themselves to bringing you high chances of multiplying your winnings, these being only a few of the reasons why they’re one of the leading companies in the slots industry. Haunted Hallows proves all of the above with its spooky 3D graphics and intuitive gameplay that turn fear into exciting fun. There’s a reason why people watch horror films: it is because they enjoy the thrill and adrenaline rush that comes from being scared, from thinking you’re in danger without actually being so. In the Haunted Hallows slot game, ghosts, witches and monsters come to play with you and even help you win, if you’re brave enough to come closer and push the spin button. There’s no better activity on a moonlit night, next to a creepy castle. If it’s Halloween, even better, but after all, a holiday isn’t needed to play this universally fun game. It’s okay if you have to keep the light on when playing Haunted Hallows. It’s 3 reels are packed with odd potions, black cats, skulls and creatures of the night. The foggy background doesn’t help, neither is it relaxing, but the big sign that states the highest win of the game might warm up your courage-15.000 credits. You can bet anywhere between 0.01 and 5.00 credits, and adjust the number of paylines, up to a maximum of 9. It’s a rather simple and straight-forward slot experience, so even unexperienced players can give it a go easily, while the silly and spooky symbols will keep you curious. The basic winning combination in this slots game is to spin 3 symbols of the same kind on a payline. The Halloween Candy Symbol is one of the Scatters and if you spin 3 of them anywhere across the reels, 8 Free Games await you. That’s not all, though, as you’ll also have the chance to triple your winnings. Sounds like a proper treat! The other Scatter, the Jack-O-Lantern symbol, activated the Prize Pick Bonus, when you get 3 of them on the same spin. Then, you get the chance to choose 3 out of 9 carved pumpkins and multiply your prize by as much as 111x! If at any point you feel Haunted Hallows and its ghosts aren’t giving you enough thrill, you can always choose the Gamble option and pick one of the two candies to either double your win or get nothing. That should get your blood racing! Whether it’s ghosts, witches or skulls you’re afraid of, this 3-reel slots game has it all, guaranteeing a harrowing experience. That is, until you count your wins, of course. If you're interested, more slot bonuses are shown here. 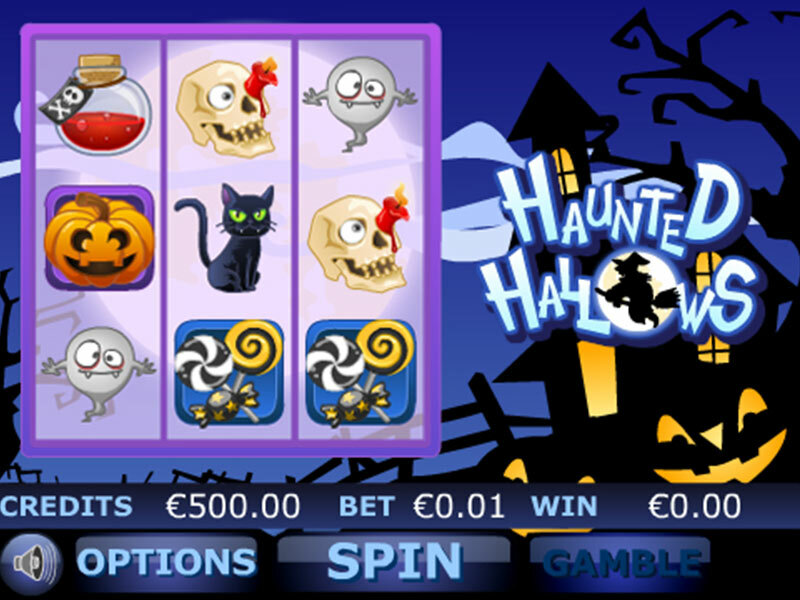 Haunted Hallows is an exciting slots game that aims to give you an unforgettable experience. It is perfect for playing on Halloween of a bit of a treat, or on any dark night, for the best results. However, prizes can be won at any time and you won’t have any fuss in doing so. Another wacky game is our Gem Rocks Slot. For more information, visit Easyslots.com!